These gloves are awesome! They are super protective and will protect your hands. You can use them when you are grilling, baking, or cooking. It is really think material though so cooking might be hard to do. I used mine when baking. I could take the pans out without burning myself without even having to use a pot holder! Since it’s grilling season here I’ve been trying them out on the grill too! It’s so hard to find something to use on the grill that won’t burn you or won’t catch on fire like a towel. They are easy to use, just slip them on and you are ready to go! They are made of a very thick silicon material so I don’t see them tearing anytime. I am loving mine! This set also comes with a three piece silicon utensils set that includes a spatula, spoon and brush. I love silicone cooking tools because nothing sticks to them and they are so easy to use. ✔ LIMITED TIME SUPERIOR BUNDLE BONUS – If you buy today you’ll get entirely FREE three extra cooking utensils: 2 sizes ergonomic seamless easy-to-clean Silicone Spatulas and one premium reinforced silicone brush. TAKE ADVANTAGE of this super deal now! ✔ BACKED by BakeitFun Lifetime Money-back GUARANTEED We only develop products that were carefully tested. 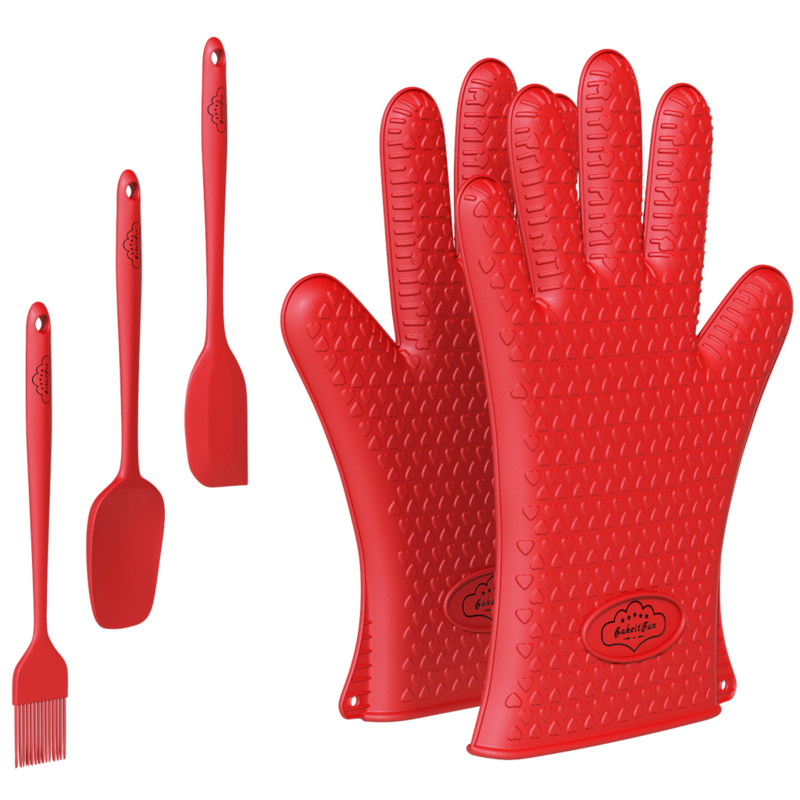 We are pretty obsessed with making YOU happy – Buy the best with confidence – Love our silicone oven mitts set or get every penny back, no questions asked, it’s that easy. i would love to have a chance to win this. thanks.